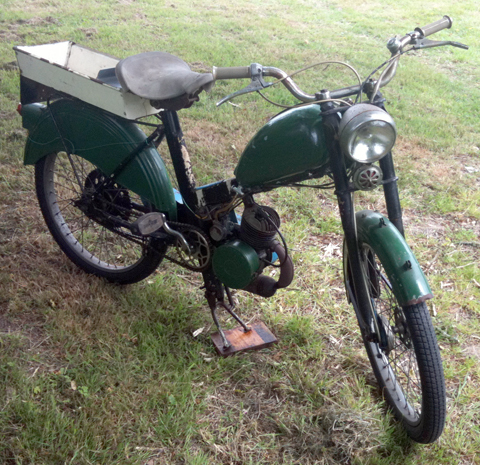 That such an eccentric moped should bear the name of Corvette, which was, of course borne proudly by one of the most famous American sportscars, the Chevrolet Corvette, is somewhat ironic. The Chevy was itself named after a small, very manoeuverable class of warship, smaller than a frigate but larger than a sloop-of-war, that had been in use with the French and British navies since the mid-17th century. 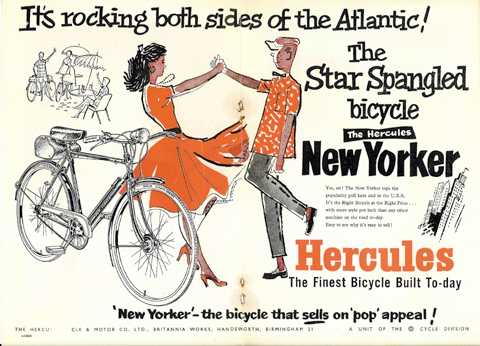 The Hercules moped has as little in common with a manoeuverable warship as it does an iconic Chevrolet thoroughbred sportscar, though presumably this previous use of the name is what allowed its use for the moped. 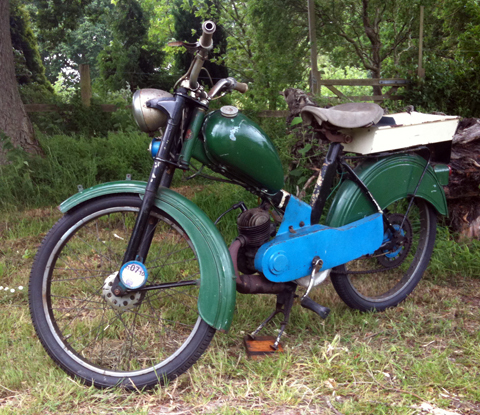 With little to recommend it at the time – apart, perhaps from some snazzy adverts – fifty years later, the Hercules Corvette is now one of Great Britain’s rarest mopeds. 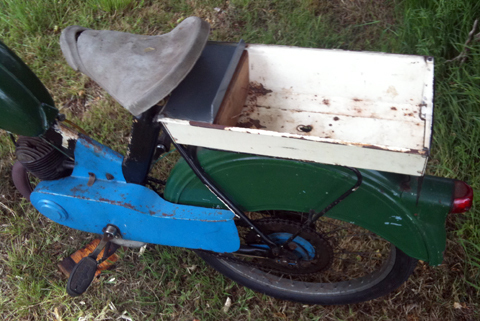 What I liked most when I first saw this Corvette is that it’s in exactly the condition mopeds were in when I first started collecting them back in the seventies. 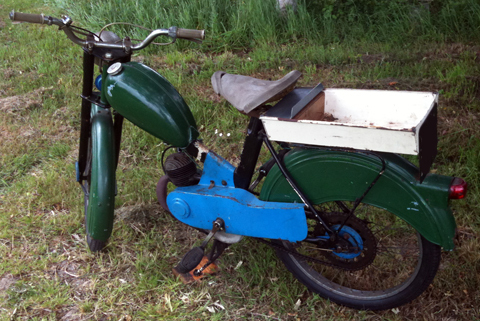 It’s not restored at all, but brush-painted in boring brown and garish blue and with a stupid box on the back for a luggage carrier. 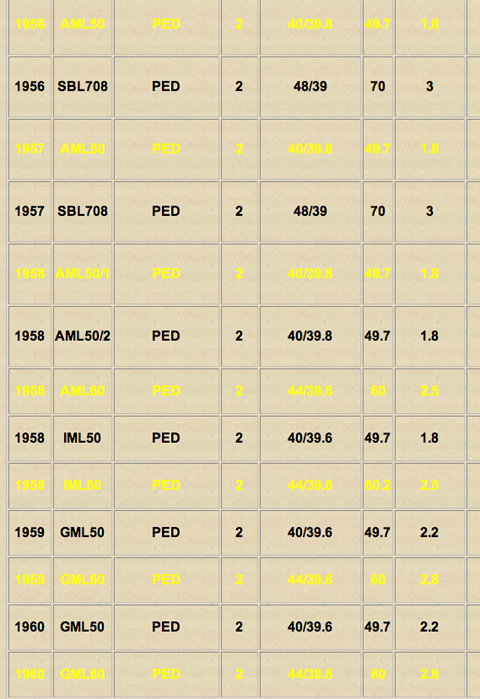 I have no interest in over-restored machines. 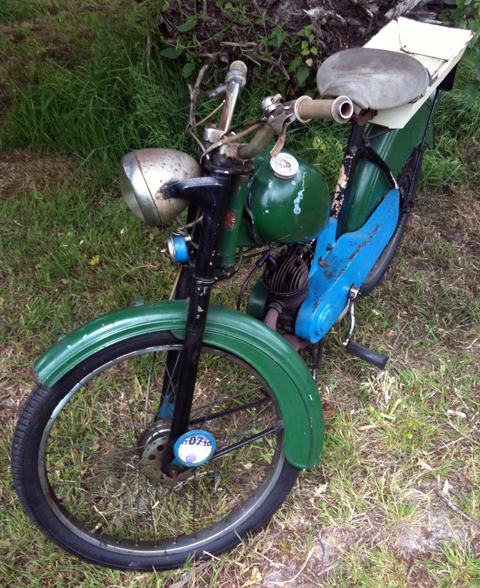 I like my bikes ‘lived-in’ and this one is exactly that. So it’s not a time-warp from 1960. 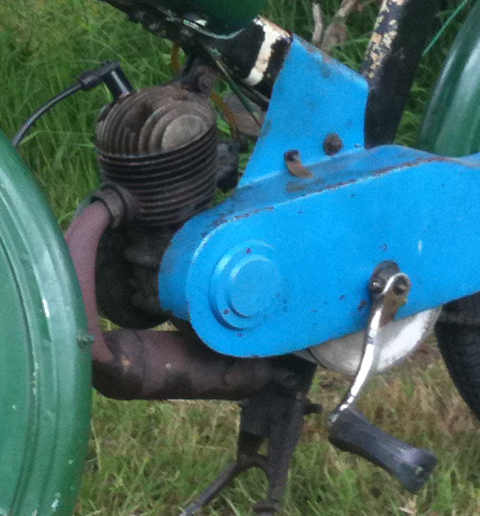 It’s a time-warp from the 1970s, when old mopeds were simply old bangers you kept on the road with any heath robinson modification. The first thing that surprised me about it is that it’s so easy to start. 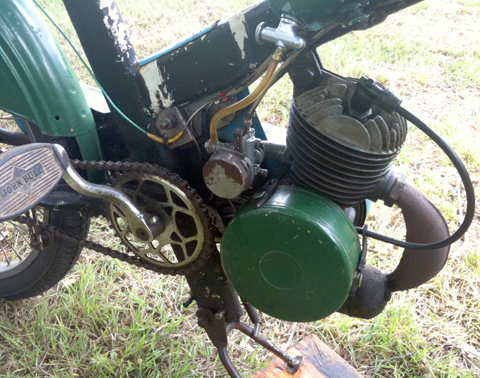 In fact, it’s hard not to start it – there’s no decompressor, and with a bit of petrol still in the carb after running it, sometimes when you push it the engine kicks in and off it goes! The Corvette was essentially too little, too late. 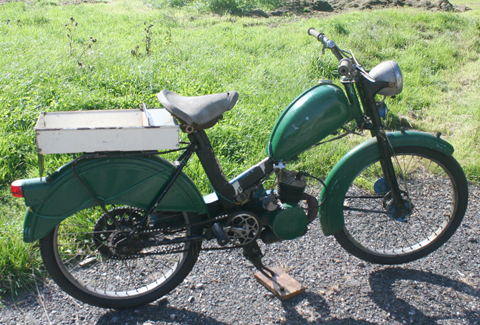 By 1960, when this Hercules moped eventually nudged its nose out of the door of various showrooms that had been coerced into stocking it, the NSU Quickly was already advancing towards 3 gears, and the duff British Raleigh with Sturmey Archer engine was about to be superseded by the very popular imported French Mobylette, duly re-badged as a Raleigh. 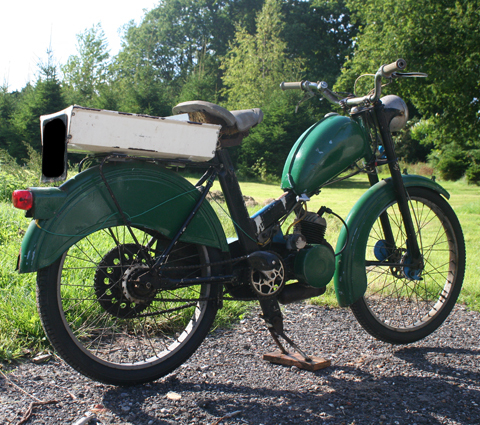 The end of the market that the Corvette was therefore aimed at – ie stodgy, slower, cheaper mopeds – was already well catered-for by Phillips Pandas and the like, plus a whole range of imported French and (often re-badged) German affairs. It lasted for only one year. It was probably dumped on the colonies to boost its sales record. 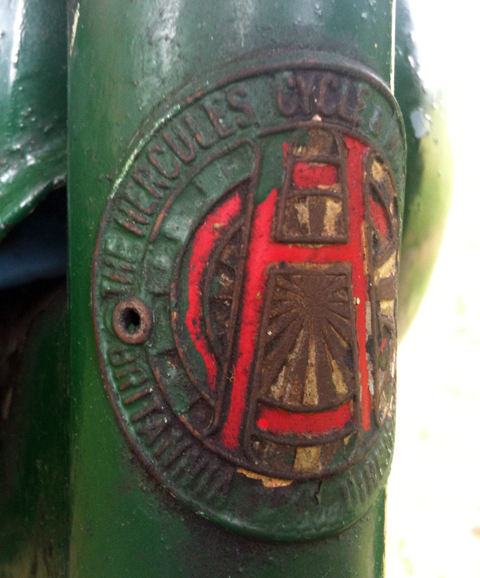 Its only saving grace (retrospectively) was that it was the final motorized machine to bear the Hercules name badge. Ted Crane’s grave most likely stirred inconsolably. 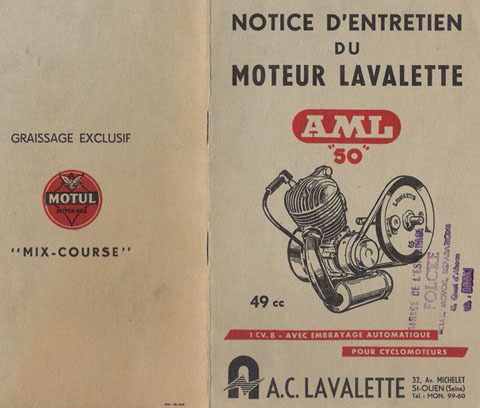 The Lavalette ‘AML 50′ was a very basic French proprietary engine that had a reasonable reputation in France, but was mostly used on the basis of its cheap price. 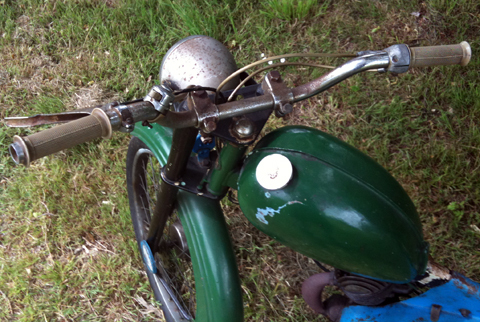 It was best known for its use in Paloma mopeds. 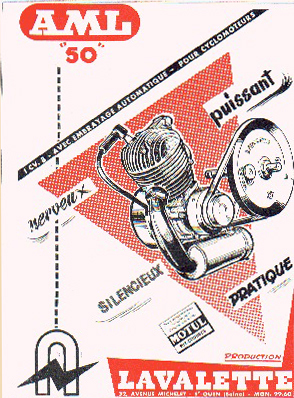 As you can see from the chart below, the ‘AML 50′ engine used in the Corvette had been replaced in 1958, so Hercules no doubt purchased the engines at a knock-down price for their 1960 machine.